Our historian and cultural specialist Ms. Bonita M. Harmon has dedicated nearly twenty years of her life to her studies of Japanese culture. She learned to speak Japanese at the early age of five; this lead to a lifelong passion for Japanese culture. She began her cultural studies with Kimono, resulting in an over 200 piece private collection of Japanese apparel. 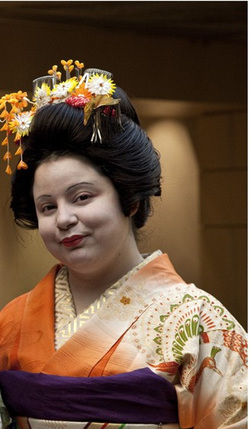 Japanese history with an emphasis on geisha. In 2006, to better share her passion for Japanese culture with others, she founded Kimono-San of St. Louis, to provide quality entertainment & educational experiences to a wide variety of people. She is a passionate educator. With experience in university lecture halls, elementary class rooms and performing at other public and private events.